You can help save the beautiful Scarlet Macaw! Become a fundraiser as part of the Chiquibul Challenge Marathon 2019 today and help raise money for the Belize Wildlife & Referral Clinic (BWRC) AND the Friends for Conservation and Development. As a fundraiser you can raise 20 times more than a single donor to protect this rare bird. 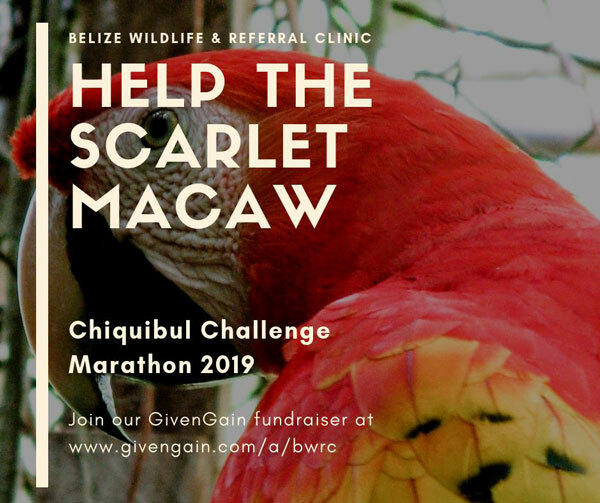 We are very excited to announce that we organizing the Chiquibul Marathon as a fundraiser for Friends for Conservation and Development (FCD), and the Belize Wildlife and Referral Clinic’s (BWRC) Scarlet Macaw efforts. This winning submission from our Experiences category comes from Wendy Parker from the University of Tennessee. The Scarlet Macaw Protection Program is a conservation initiative between the Wildlife Institute (WI), the Belize Wildlife & Referral Clinic (BWRC) and Friends for Conservation & Development (FCD). We enjoyed having Hayley join us! Register today for hands-on veterinary experience in Belize. Petunia the Porcupine along with the Belize Wildlife & Referral Clinic and Wildlife Institute Team wish you all a Happy Holidays! Exciting Veterinary Courses in Belize & Guatemala! Join the Wildlife Institute and the Belize Wildlife & Referral Clinic​ for Exciting Veterinary Courses in Belize & Guatemala! Spend Summer 2016 in Belize & Guatemala with the Wildlife Institute!